I am very excited about the Los Angeles’ 21st-century bid to host the 2024 Olympic and Paralympic Games. My excitement is not just about the stadiums that will fill to capacity and the people who will come together and happily celebrate the best that the world’s athletes have to offer. It’s that I know that Los Angeles is at its best and truly thrives—when it supports excellence. The 2024 Olympic Games will build on the excellence of the 1984 Olympic Games. The story of those highly successful Games is worth repeating, since it’s been 31 years and the average age of Los Angeles residents is 34. Olympic Games are not two-week affairs; they are years-long efforts that, at their best, bring together a city’s residents and leaders to plan for a better future. I first became involved in the ’84 Games in 1977, when Los Angeles was competing against New York to be the U.S.’s candidate. I was a member of the U.S. Olympic Committee board of directors that selected Los Angeles over New York. It was the third consecutive time the city was selected by the U.S. Olympic Committee, but, previously, the International Olympic Committee ultimately had chosen Montreal in 1976, and Moscow in 1980. The third time was the charm. While Angelenos were enthusiastic about the Olympic Games coming to their city, they were concerned about costs. Following passage of a 1978 city referendum that ruled out municipal Olympic funding, the USOC stepped in as the financial guarantor. Dressing the city for the Games started slowly. Olympic murals were painted on the freeway walls. Sports venues were painted with colors, symbols, and shapes that were distinctive—turning a disparate group of arenas into a network. Even streetlights were decorated in what came to be called “Festive Federalism” style. In May 1984, the Olympic flame began a long and highly publicized journey from New York City. 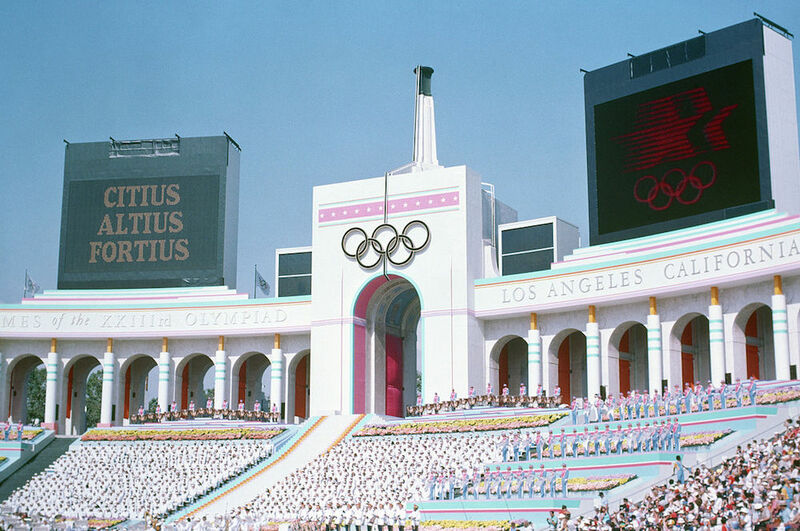 In June, the Los Angeles Olympic Organizing Committee built excitement leading up to the Games by kicking off an Olympic Arts Festival, which lasted through the games and featured artists representing the cultural richness of the United States, and Los Angeles in particular. And just before the Olympic Villages opened, staff and volunteers began to appear around town in distinctive uniforms. A great athletic event, we learned then, can make the sky bluer. Literally. Measures to reduce traffic started two weeks before the games, and the mountains, rarely seen in the summertime, appeared in their full glory. Soon Angelenos got out of their homes to be with each other and take part, as spectators and volunteers. It helped that the Los Angeles business community, labor organizations, and various private and public entities adjusted employees’ work schedules to reduce traffic in peak hours and give employees an opportunity to volunteer. This made it possible to create, under the leadership of Peter Ueberroth, the largest group of volunteers amassed in the history of the Olympic Games. The athletes were happy. I know this because they told me so when I worked in the Olympic Villages. They were split between two main villages, at USC and UCLA, and a smaller one for the rowers and canoe/kayakers, at UC Santa Barbara. All of the athletes were provided with an innovative new form of communication at the time: electronic mail. Yes, really. It was nearly a decade before the Internet would be widely available, but every athlete could sign in and send messages to any other athlete or credentialed member of the Olympic family. For two weeks, Los Angeles celebrated human excellence—the athletes’ and its own. Once the games concluded, a sizable surplus provided the USOC with approximately $139 million and endowed the LA84 Foundation with approximately $93 million. The LA84 Foundation, which I lead today, continues to fulfill its mission to serve youth through sports and to enhance the knowledge of sport in society. Since inception in 1985, we have spent more than $225 million to introduce the magic of sport to more than 3 million girls and boys, to train of more than 80,000 coaches, to provide swimming lessons for hundreds of thousands of youngsters, and to make grants to about 1,200 organizations. Our endowment is nearly $160 million. So why should L.A. aspire to do it all over again? Because it won’t be the same. It will be better. For one, it will be a bigger and more inclusive event. The 2024 Games will include the Paralympic Games, which were not part of the 1984 Olympic Games package. Serving those games will make the city better prepared to accommodate all athletes in the future. The athletes for the Games of 2024 will look much more like the population of the world in which they live. There will be equal numbers of men and women competing. Each athlete will have met a qualifying standard high enough so that the number of athletes admitted to the games is not overwhelming. The large increase in national Olympic committees—50 more since 1984—has required a tightening of standards. Thus, the quality of athletic excellence, and the excitement of the competition, will be greater than the last time L.A. hosted the games. And in 2024, all of the athletes who qualify will be able to attend. The IOC has developed methods for overcoming political intervention in the right of athletes to compete. The athletes will no longer suffer the scourge of politically motivated boycotts of Olympic Games, as we saw in 1980 and 1984. I was among those athletes who were denied our test with history in 1980 when the Carter administration first demanded a boycott. Sadly, athletes from 16 National Olympic Committees were similarly denied their opportunity when the Soviets reciprocated by staying home from the 1984 Olympic Games. Nothing changed as a result of the political action, except that the lives of the athletes who were kept at home have been forever diminished. There will be more sports and more disciplines on the program for 2024. In 1984, we had 26 Olympic sports and two “demonstration sports,” which don’t officially count toward medal totals but show off sports popular in host countries. In 2024, we will have at least 28 Olympic medal sports and potentially two more events important to the U.S. The 2024 Games would be transformational in other ways. The games will employ solar energy and other ecologically friendly approaches to a greater extent than any games to date. With our close relationship to the digital and entertainment industries, we will be able to combine leading-edge concepts and best practices from those and other industries. The venues will be both old and new: Los Angeles has 80 percent of the venues in place today that it will need in 2024, and 80 percent of those existing venues (such as Staples Center and the Stub Hub Center in Carson) have been created since 1984. And the 2024 plans for just one Olympic Village could itself be transformative. One option is to create a new housing complex along the Los Angeles River that will be created by private builders and rented for the time of the games. After the Olympic and Paralympic Games, the housing will be sold to private citizens. This plan is reminiscent of the 1932 Olympic Village for men, in Baldwin Hills, which was the first such housing created for the Olympic Games. In 2024, you will see not only a greater Olympic Games, but also an even greater city. In 21st-century Los Angeles, as in the Olympic Games, we strive for citius, altius, forties; faster, higher, stronger. Simply, we strive to excel. Anita L. DeFrantz is president of the LA84 Foundation. She is a member of the International Olympic Committee executive board and a 1976 Olympic bronze medalist.This essay is part of Is L.A. Still a City of Big Dreams?, a project of Zócalo Public Square. Primary editor: Joe Mathews. Secondary editor: Paul Bisceglio. *Photo courtesy of U.S. Air Force.